Crookey Cottage is the original farmhouse at Crookabeck farm, which is a traditional Lakeland smallholding of 40 acres. The house was built around 1700, and has the features and layout of a typical Westmorland Smallhouse. The Downhouse, with inglenook fireplace, would have seen most day-to-day activity, with the oak-partitioned parlour originally for sleeping, then reserved for special occasions and visits from the clergy. The first floor probably started life as a hay loft, only later being converted to bedrooms. Just as today, the need for more space was inevitable and the ground floor was extended back into the fellside, perhaps to provide a dairy and scullery either side of the “dog leg” stone staircase. The roofline was amended to include these extensions, in what is known as an “outshut” design. Around the middle of the 19th century, a subsantial extension was added at right angles to the main house to provide a dedicated kitchen, and it is the first floor of this which comprises our b&b ensuite accommodation. As elsewhere in the house, the oak trusses and beams in the room show signs of former use. These are very likely to be ship’s timbers, commonly salvaged at Whitehaven on the Cumberland coast, and favoured for being pre-seasoned and cheap. Place names around here have changed quite a bit over the years – in the early 19th century the farm was referred to as Crookey Beck in manorial tithe records. By 1861, the first Ordnance Survey had the farm, and the stream which runs through it, down as Crooked Beck. The second edition O.S. map of 1898 has the current names Crookabeck and Stonebarrow Gill respectively. 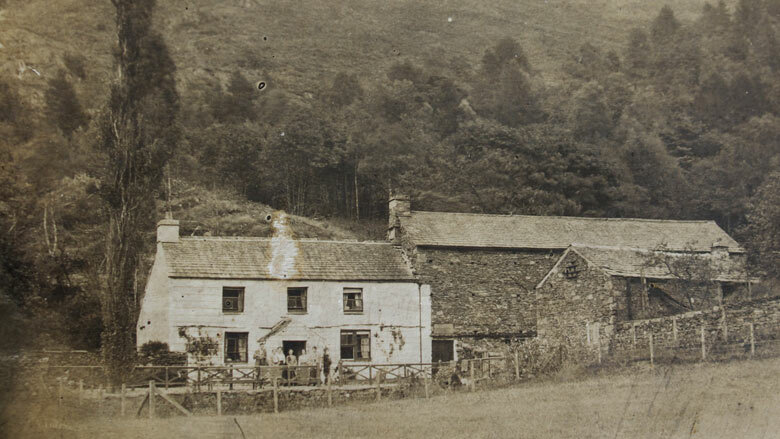 The size of the farm has also changed – in 1839 it is recorded as 52 acres,2 roods and 11 perches. Unusually for the Lakeland dales, there are no “fell rights” to graze animals on the open fellside – these were lost/sold sometime in the early 20th century. At the start of the 20th century, Crookabeck was being farmed by Robert Pears, who also ran a successful business as a “carrier”, running a passenger char-a-banc service between Patterdale and Penrith.